(Phys.org)—An international team of researchers has spotted the first instance of a high-energy neutrino collision from a source outside of the Milky Way, marking what they describe as a significant discovery. 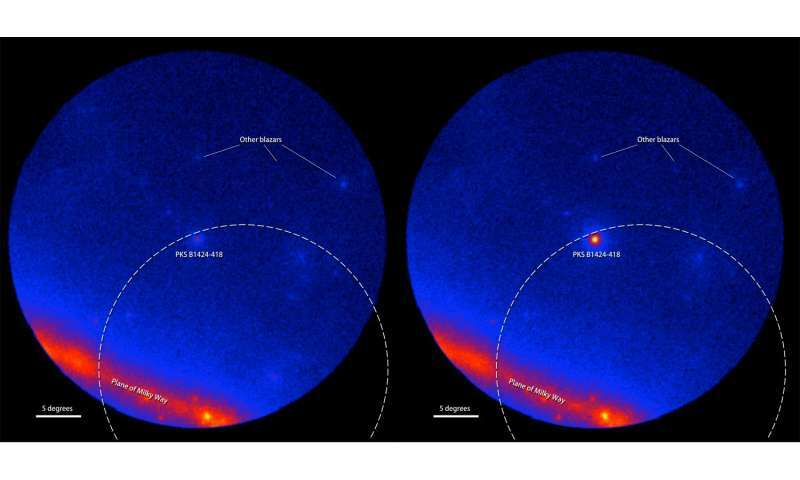 In their paper published in the journal Nature Physics, the team describes their work at the South Pole Neutrino Observatory, the details pertaining to the sighting and why they believe their discovery may lead to a new era in neutrino astrophysics. Neutrino's are massless and have no charge and very seldom interact with other matter—the exception is when they collide head on with another particle. Scientists have been studying neutrinos for several years, believing that they may hold the key to understanding many parts of the universe that remain otherwise hidden from our view. To see evidence of them, researchers fill large underground tanks with different types of fluids and then use extremely sensitive sensors to capture very brief flashes of light which are emitted when a neutrino collides with something in the fluid. The team with this latest effort has taken a different approach, they have placed sensors around a kilometer sized ice cube 2.5 kilometers beneath the surface, in a location near the South Pole. The sensors capture the brief flashes that occur when neutrinos collide with particles in the ice. The astrophysical sources of the extraterrestrial, very high-energy neutrinos detected by the IceCube collaboration remain to be identified. Gamma-ray (γ-ray) blazars have been predicted to yield a cumulative neutrino signal exceeding the atmospheric background above energies of 100 TeV, assuming that both the neutrinos and the γ-ray photons are produced by accelerated protons in relativistic jets. As the background spectrum falls steeply with increasing energy, the individual events with the clearest signature of being of extraterrestrial origin are those at petaelectronvolt energies. Inside the large positional-uncertainty fields of the first two petaelectronvolt neutrinos detected by IceCube, the integrated emission of the blazar population has a sufficiently high electromagnetic flux to explain the detected IceCube events, but fluences of individual objects are too low to make an unambiguous source association. 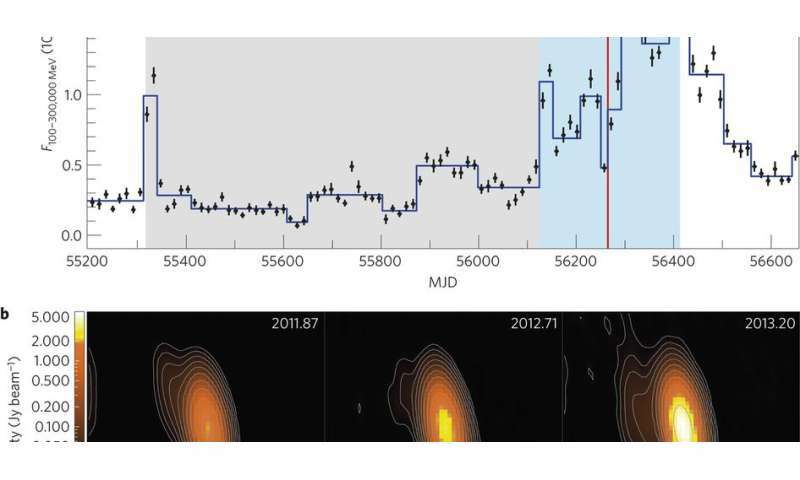 Here, we report that a major outburst of the blazar PKS B1424–418 occurred in temporal and positional coincidence with a third petaelectronvolt-energy neutrino event (HESE-35) detected by IceCube. On the basis of an analysis of the full sample of γ-ray blazars in the HESE-35 field, we show that the long-term average γ-ray emission of blazars as a class is in agreement with both the measured all-sky flux of petaelectronvolt neutrinos and the spectral slope of the IceCube signal. 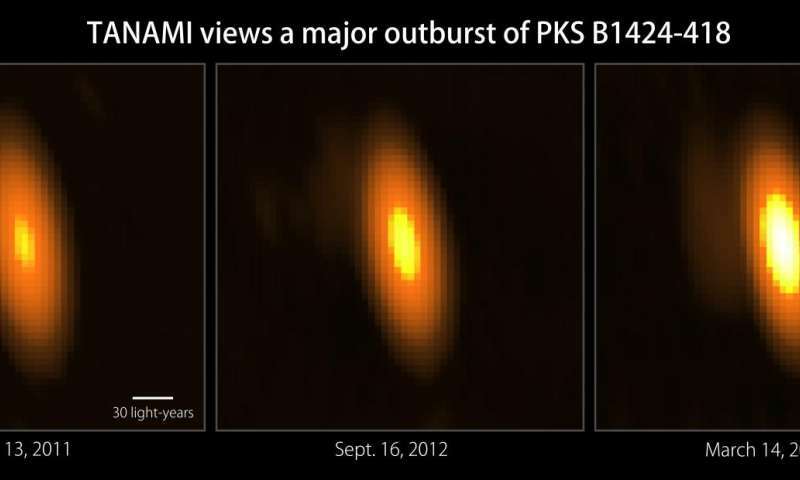 The outburst of PKS B1424–418 provides an energy output high enough to explain the observed petaelectronvolt event, suggestive of a direct physical association. Why does this look as a impulse spread over a long time? Looking at the first largest neutrino suspect something missing. So if this is over a space not a focal point then ... Not sure we know what we are seeing. Any theory upon such weak data is questionable. neutrinos are NOT believed to be massless, as the writer claims. The modified Standard Model requires the neutrino to have mass in order for it to interchange between electron, muon, & tau neutrinos. Simple consideration of speed suffices: as a massless particle their speed would be c, and at c no time elapses for them (proper time) making transformation from one type to another impossible. Hence we assume they have a tiny but finite mass. Duh. Simple consideration of speed suffices: as a massless particle their speed would be c, and at c no time elapses for them (proper time) making transformation from one type to another impossible. Hence we assume they have a tiny but finite mass. Duh. As it is explained to me, the time dilation of moving at C is not the reason why neutrino's are considered to have mass. The measuring a neutrino oscillation requires a non-zero mass difference to have a non-zero probablity of measuring it. Having a non-zero mass difference requires mass to begin with. At least, this is how a QM student explained it to me. It makes sense and doesn't need relativistic speeds to explain the mass of a neutrino. @Hyperfuzzy: "Why does this look as a impulse spread over a long time?" What do you mean, what impulse and what spread and what time scale are you looking at? "Why do they see a different space". Just look at the entire shape of the curve. Approximate it as a smooth curve over time. Note the scarce number of data points. I ignore Dr. E as nonsense, go figure. I also take QM with a grain of salt. i.e. seek, be definitive and casual. The "cat" states the non-causality for predictability, not a puzzle. That is, do we have definitive field information; hence, QM? From underground the event may be local. A better measure is required. I suggest a manner to create neutrinos from neutrons by placing into a chamber, measure time to split as a function of potential. Also simulate a proton and an electron combined to create a neutron. Hence, work! There are no short cuts and digging holes and smashing protons is not useful. What's missing is the analysis of everything else, i.e. no calibration to any event. The speed of any particle or wave-front may be from 0 to infinity. Think! The initial wavelet as seen by two observers at the same place with different velocities. Or simply see how fast the wavelet passes you. That is, the original wavelength divided by the total time to pass, the measured period. Jeez! Walking down the boulevard today, I got hit by half a trillion neutrinos on my way to work. They seemed to come at me from every direction, passing directly through my body, hit the pavement and continued on down toward the upper mantle. I don't know if they kept on going through to the other side of the Earth. If they did, I am almost certain that some person in China may have experienced the same and lived to tell about it.